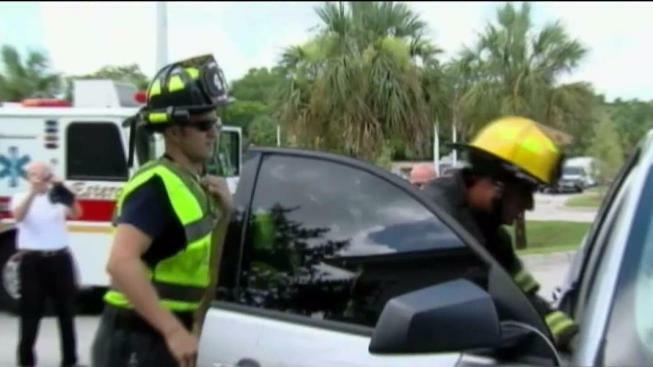 A new study is delving into the dangers that can be posed by hot cars in the summer. NBC 5's Lisa Parker has more details. It happens more quickly than you might think. On a hot summer day, temperatures inside a car parked in the sun can reach 160 degrees in an hour, according to a new study. And one hour is about how long it can take for a child inside that car to suffer a heat stroke or even die from hyperthermia, experts say, issuing a dire warning as summer approaches. According to the National Safety Council, an average of 37 kids die in hot cars every year in the U.S. The agency says incidents tend to peak between Memorial Day and Labor Day, when between two to three kids die each week. The study released Thursday by researchers at Arizona State University and the University of California San Diego examined how long it takes for different types of cars to heat up in various conditions of sunlight and shade. Researchers tested six vehicles: two identical silver mid-size sedans, two identical silver economy cars, and two identical silver minivans. The vehicles were parked in different conditions over the course of three hot summer days in Arizona, with temperatures above 100 degrees. Vehicles parked in the sun took just an hour to hit an interior temperature of 116 degrees, while seats heated up to 123 degrees and the dashboards hit a scorching 157 degrees. In those conditions, a child's body temperature could reach 104 degrees in about an hour if the car is parked in direct sunlight. Even parking in the shade can be lethal, the study found. For vehicles parked in the shade, interior temperatures reached an average of 100 degrees after one hour. "We’ve all gone back to our cars on hot days and have been barely able to touch the steering wheel," Selover said. "But imagine what that would be like to a child trapped in a car seat. And once you introduce a person into these hot cars, they are exhaling humidity into the air. When there is more humidity in the air, a person can’t cool down by sweating because sweat won’t evaporate as quickly." Gene Brewer, an ASU associate professor of psychology who studies memory, said it’s very easy to become distracted and warned that memory failures can occur when a routine is changed - such as an unexpected phone call on the way to work, or a different day care drop-off. "These cognitive failures have nothing to do with the child," Brewer, who was not involved in the study, said. "The cognitive failure happens because someone’s mind has gone to a new place, and their routine has been disrupted. They are suddenly thinking about new things, and that leads to forgetfulness. Nobody in this world has an infallible memory."